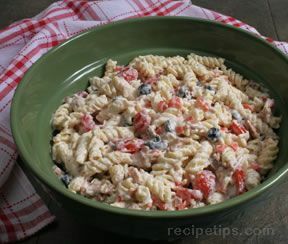 You will love this easy to make Ranch Pasta Salad for your summer or anytime get-togethers. This salad is full of flavor and perfect as a side dish to any of your grilled food. Cook pasta according to package directions; drain and cool. 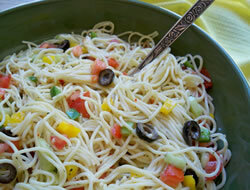 Add bacon, red pepper, tomatoes and olives. In a separate bowl, combine salad dressings. Add enough dressing to salad, per your liking and put any remainder in a separate covered container. Chill salad and remaining dressing for about 2 hours. One hour before serving, gently stir salad and add desired amount of remaining dressing. 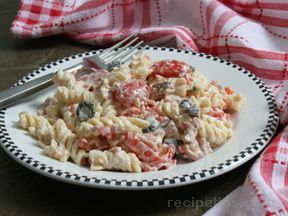 "Tasty pasta salad! The bacon and red bell pepper really added great flavor. Even my teenagers liked it. I will definitely save this one in my recipe box."